To call insurance agent Tim Lippe (Ed Helms), “naïve” is a gross understatement. He’s never left his small hometown. He’s never stayed at a hotel. And he’s never experienced anything like Cedar Rapids, Iowa. 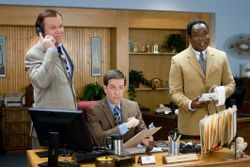 Sent to represent his company at the annual insurance convention, Tim is soon distracted by three convention veterans (John C. Reilly, Anne Heche and Isiah Whitlock Jr.) who will show him the ropes and push his boundaries. For a guy who plays everything by the book, this convention will be anything but conventional.